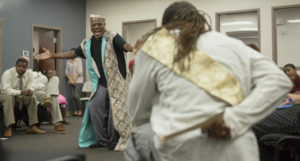 The Delaware Shakespeare Community Tour aims to bring professional Shakespeare performances to the full spectrum of humanity in our state. 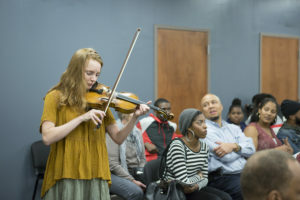 The centerpiece of the tour is eighteen performances at homeless shelters, detention facilities, community centers and other non-traditional locations where people may have limited access to the arts. Many of the tour performances are open to members of the general public and represent a powerful viewing experience. Individuals must RSVP. Open seats are limited so as to maintain the focus of each performance on the individuals served by each partner venue. EMAIL INFO@DELSHAKES.ORG TO RESERVE YOUR SPACE. 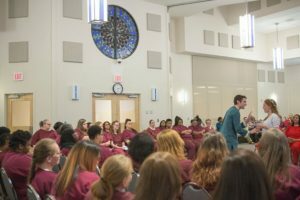 The Community Tour commenced in November 2016 by offering performances of Pericles, Prince of Tyre in all three Delaware counties, serving 619 individuals. Ten of the tour performances were open to the general public to attend as guests at our community venues, creating wonderful audiences from all walks of life. The feedback Delaware Shakespeare received from audience members for Pericles was extraordinary, some of which is included below.